The lounge features furniture designed by Michele Bonan. Last month, I posted about the gorgeous JK Place Hotel in Florence, Italy. While doing my research, I came across the Florence hotel's light-hearted cousin, the JK Capri Hotel. 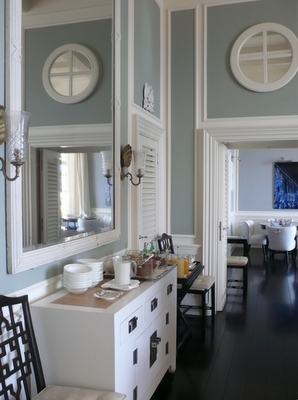 Equally chic and polished, the Capri hotel wears its personality on its sleeve. The Ferragamo owned hotel was also designed by Italian architect and interior designer, Michele Bonan, whose signature style is present throughout the hotel. The JK Capri is set in one of Italy's most beautiful destinations. 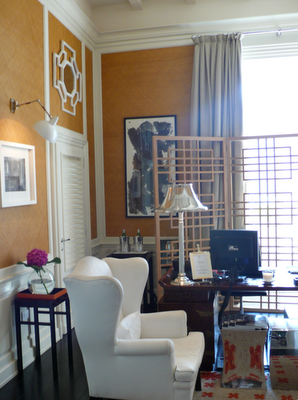 The fabulous library features Bonan-designed furniture, vintage pillows, and framed photographs of famous guests. Despite the fact that Bonan used more color in this hotel than in the one in Florence, his signature use of white upholstered sofas and chairs, dark wood furnishings, and dark wenge floors is still present. I love the contrast of the navy blue walls, white furniture and architectural detailing, and the blue accessories in the lounge. M.A. Belle was lucky enough to vacation at the JK Capri back in July. This is her take on the hotel lounge. Evidently, Bonan doesn't like for his reception areas to look like the typical check-in area of a standard hotel. I love that it looks more like a luxurious home. The walls are woven seagrass in a warm yellow, which looks fantastic against the white paneling and dark floors. 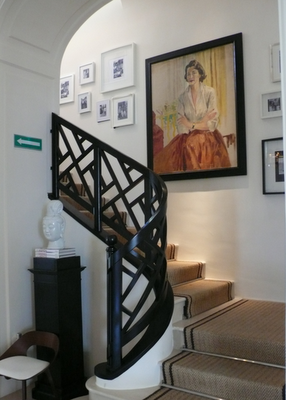 I die over the Bonan-designed, Asian-inspired staircase. I'm not a huge fan of Asian details in decor, but this just takes my breath away. The banister, the runner, the artwork...it's just perfect. Make sure to check out her post on the hotel for many more pictures and details from her stay there. So funny I just finished posting about hotels in Italy and wrote about Michele Bonan's work in Ferragamo's Portrait Suites Hotel in Rome. That painting over the staircase is AMAZING! Mrs.Limestone, that painting would look incredible in your gorgeous home! Loved this Post and now I need to run to M.A.Belle to see more. Capri is just a dream, the light, the scenery, the faraglioni, la Piazzetta...can't wait to go back.